It has been my dream for several years to have my genome or exome sequenced. Working with NGS data every day tends to have that effect. The closest I came to that possibility was when some family members of mine underwent genetic testing for RP. There was a remote chance, that if standard screening came up empty, there might be some exome sequencing. Maybe I’d get to be a control. Alas, the CLIA lab that did the test knows their business, found the [common] causal mutation, and that was that. Of course, the powers that be here cautioned me that I wouldn’t get to analyze the data anyway, if family members became part of the research cohort. Since getting my genome or exome done seems unlikely, I went with the next best thing: personal genetic testing service (affiliate link; see blog disclosure) available from 23andMe. For $99 plus shipping, I got this fancy-looking box in the mail. 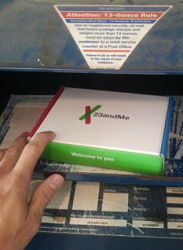 The celebrated 23andMe spit kit. The experience was somehow fascinating and a little gross at the same time. But I got it done, and sent my kit off to California. Meanwhile, 23andMe began to tactfully bombard me with e-mails about what I’ll learn when the analysis is done. Before we get into that, let’s talk about the SNP chip itself. That last point is very important, because as more common variants are associated with phenotypes in GWA studies of thousands of samples, those findings can be incorporated into 23andMe’s database. However, I should take this moment to remind you that variants reported by GWAS are associated with phenotypes, not the cause of them. Most of the 700K SNPs, in fact, are located outside of exons, which permits them to rise to higher allele frequencies and become informative genetic markers. Because the HapMap and other projects have genotyped millions of SNPs in dozens of human populations, it’s possible to quantify how much ancestry an individual shares with different continental groups. 23andMe calculates your “unique mix of ancestry from 22 populations”. Most of us have a pretty good idea what continent(s) our ancestors hailed from, but this provides both a measure of the contributions, as well as a breakdown of geographical/ethnic groups (sub-saharan Africa, northern or southern Europe, Ashkenazi, Native American) that may be interesting. With a name like Koboldt, I’m expecting mostly German ancestry with some Irish and English, but I’d love to be surprised. Carrier status for causative mutations underlying 50 inherited diseases, such as beta thalassemia, cystic fibrosis, Fanconi anemia, Tay-Sachs diseases, phenylketonuria, etc. Most of these are well-understood Mendelian disorders, many of them part of newborn genetic screening programs in the U.S. and elsewhere. Variants associated with drug response (n=50). Pharmacogenetics studies have identified variants that predict sensitivity/response to numerous drugs, from beta blockers to statins to warfarin (Coumadin). Population-specific risk genotypes for 120 diseases. Genome-wide association studies have identified numerous variants that are associated with increased risk for many diseases. 23andMe has curated the literature to focus on replicated findings for many conditions: cancers (e.g. breast, prostate, melanoma), psychiatric disorders (e.g. bipolar, schizophrenia), vision loss (AMD, glaucoma), cardiovascular/metabolic disorders (diabetes, heart disease), and others. You’ll note that these are complex traits in which numerous genes and environmental factors play an important role. Human traits. Variants associated with heritable traits will also tell you things that you probably already know, like hair color, eye color, height, blood group, caffeine consumption… and some that you might not, like resistance or susceptibility to certain infections. The 23andMe service is not new, and many of my colleagues have done it already. That includes two fellows who happen to be twins, and only realized they were identical twins after getting the test. Wish I could have been around for that “Ah ha!” moment (“You have that SNP? Me too!”). Cost. The service is now $99 with a 20% discount on additional kits (if you want to have family/friends tested). That’s pretty cheap, especially considering the cost of cell phones, health care, gas, utilities… you get the idea. Uncertain future. This is not an FDA-approved procedure, and while 23andMe provides all kinds of cautions, let’s be honest. There’s key medical information here, and it’s available to just about anyone. That makes a lot of people nervous. Some states have already passed laws restricting direct-to-consumer genetic testing. Ironically, the offices of the NIH are located in one of these (Maryland). I wanted to get in while I can, because it seems likely that open access to 23andMe won’t be around forever. Disclosure: this article has affiliate links.